Capturing student voice and engaging students in robust discussion and questioning is an important element of the Common Core Standards. It also increases teacher effectiveness and student achievement. With traditional teaching methods, reaching students who are either, too shy or not motivated to participate, can be difficult. Darlynn Alfalla, the Tech Coordinator at Wagner Middle School provided advice to the “Questioning and Discussion Study Group” at her school. She helped an interested teacher, Robin Danky, incorporate a back channel called “Today’s Meet” into her lesson. It worked like a charm. Here is the video which outlines the results. Here is an overview of the challenge they were trying to meet. 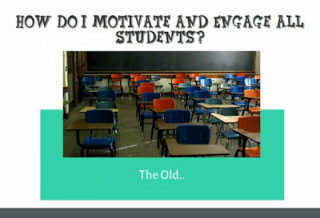 Challenge: How Do I Motivate and Engage All Students? What are some new ways to engage all students in class discussion? How do we reach students who either are too shy or not motivated to participate? We used Today's Meet which is a backchannel for classroom discussion. The idea being that students are engaged by the use of technology and they love platforms that let them chat. With Today’s Meetl students can participate anonymously or with a username provided by the teacher. When technology is properly integrated into a classroom lesson it can provide a much needed catalyst for motivation especially when it comes to asking questions. This allowed me to provide immediate and authentic feedback both during the discussion and after. It also provided the class with an archive of the discussion which could be used as a form of assessment. We found that 100 percent of the class participated in the online discussion while only 50 percent would engage in class discussions by raising their hand.